A funny incident happened when Prof KSS Nambooripad (KSSN) started his career as a faculty member in the math department of UC College, Alwaye in central Kerala. One of the students stood up and asked, why should they learn mathematics as he could not find any compelling reasons to learn it. As KSSN didn’t have a ready answer to provide, he told his student that he would discuss with his colleagues and would get back to him the next day. When KSSN returned to the staff room for lunch, he narrated the incident to a group of faculty members whom he met first and requested their response. Amazingly, all the teachers turned against KSSN in unison, in their opinion, KSSN had brought disgrace to the entire teaching community by revealing his ignorance before the students. They further added that even if he didn’t know the exact answer, a teacher should not reveal his ignorance in front of students, instead, he should provide some sort of answer even if not fully correct to hide his ignorance from the prospective disciples! The matter was brought before the staff council, where many teachers shared the opinion that KSSN did the wrong thing of accepting his ignorance and the disgrace theory gained ground among his colleagues. However, KSSN couldn’t simply digest this idea of hiding ignorance on the part of teachers. He thought that teaching was a noble profession in the sense that he had been paid for properly thinking and sharing the thoughts with a younger generation to shape their ideas and concepts to make them better citizens. That was the reason for his choice of teaching among other jobs available at that time for his kind of qualifications. In short, he disagreed with the hypocrisy of pretense and tendered his resignation from UC College. This was not the beginning of the struggle of KSSN against several odds in his life, which in fact, started as early as his childhood. KSSN was born in 1935 in an aristocratic Namboodiri family who are better known for their orthodox, traditional Hindu way of life and for their true repositories of ancient Vedic religion. As a Namboodiri child, young KSSN was not allowed to go to any one of the modern English schools that were gaining popularity at that time, instead, he was taught Vedic literature and scriptures in the traditional schools until he was fourteen years old. KSSN still remembers, a Christian teacher by name Chacko in the neighborhood always warned that he would lose a lot if he didn’t dare to throw out the traditional Vedic education and go to English schools for proper learning. KSSN knew better than anybody else that he could seldom break the iron walls of Vedic traditions and discard his alleged role as a Vedic practitioner for the well being of the community. However, KSSN was not disenchanted with the probable problems. He organized other children in the family who were also his schoolmates in the Vedic school to revolt against the head of family who was increasingly adamant to not send the children to English school. KSSN and his compatriots assembled in the foothills of their ancestral home for the safety of getting out of sight and easy reach of elders and took an oath to not eat until they were allowed to go to English schools. Though the children were scant aware of Mahatma Gandhi or his principles of non-violent resistance, they instinctively chose this truly Indian method of revolting. All the children promised each other that they would stick to the resistance plan and would not be vanquished by the wrath of elders. However, when they reached home, with the very sight of the senior most person in the family, all the courage of everybody drained away, but the grandmother appeared as a fairy godmother to save all the children not only from the wrath of others but also negotiated with the family head to allow the children to attend English school. Thus, KSSN started his school education at the age of fourteen. After succeeding masters program in mathematics, KSSN started his hunt for an advisor to guide his doctoral research. In India, even today, higher education is considered to be a status symbol and a stepping stone for better jobs. Education hardly has an influence on the quest for knowledge of the person involved nor did education have any influence on the life of an average Indian. He is usually driven by the traditional and tribal knowledge rather than applying what he has learnt during the course of his education. Thus for instance, a person going to attend his defense of doctoral thesis will consult an astrologer to check if he will get through the defense! Having said this, it is easy to follow that the educational setup is organized in such a way to churn out job hunting machines and not knowledgeable humans to serve the society which will be a microscopic minority among the whole population. As anyone can guess, KSSN didn’t succeed in finding an advisor since nobody wanted to advise him on a problem he’d chosen, but wanted him to pursue a problem which they proposed. In short, the researcher and none of the prospective advisors seem to agree anywhere which resulted in KSSN joining the state language institute as an editor of math text books. The funny incident he recollected during the not so long editorial stint was that the typesetters didn’t have sufficient number of Greek characters used in the math textbooks which caused never ending typos in proof after proofs. It was before the age of digitized typesetting, people used metal type-faces and traditional compositing. Unfortunately, math is not a prospective discipline to invest a lot of money on type-faces, so typesetters used to take out already used type from the forum of which the proof reading was completed and made use of them to create subsequent proof pages. While making next version of proofs, they did the same trick which caused never ending mistakes for Greek letters alone as they were taking out and inserting back type-faces in order to hide shortage of type-faces. When the problem was identified after a great deal of investigation, KSSN changed the typesetter to a better one. At last, Prof Sitaraman of University of Kerala came forward to supervise the research of KSSN, which forced him to resign the job in state institute of languages to the utter dismay of its director with whom KSSN had a harsh exchange of words over the wisdom of quitting the job in favor of research. KSSN was eventually awarded doctoral degree in mathematics for his fundamental research work in biordered set. 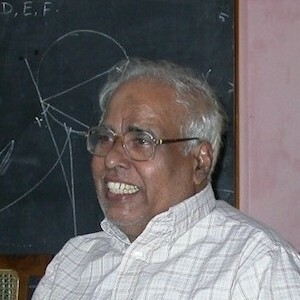 He later became Professor of Mathematics in the University of Kerala. Apart from his great contribution as a mathematician to semigroup, KSSN was instrumental in setting up Indian TeX Users Group aka TUGIndia and a great proponent of free software, in particular, GNU/Linux. Never ever in his life, KSSN has used Windows or any other proprietary operating system for his professional or personal computing except for a brief period when DOS was the sole operating system for personal computers. He brought TeX and friends when he returned to India after completing his academic assignments in Milwaukee University in the US. He installed the early DOS version of TeX in the personal computers available then in the University and when he started using GNU/Linux during mid nineties, he switched to TeX system in GNU/Linux which was all the more enjoyable to him than its DOS counterpart. He wrote all his research articles, books and even personal letters using TeX, such was the intensity of his infatuation towards TeX. In his opinion, a mathematician needs only three hours to acquire reasonable usage expertise in TeX. Contrary to the popular thinking, KSSN says, “TeX is far less complex than the mathematics which it typesets and therefore, any mathematician can use TeX much more easily than researchers of other disciplines”. I happened to meet KSSN in 1984 when he just returned home after his US assignments and introduced TeX to his colleagues and researchers in the University. I was aimlessly looking at the bleak future of immobility which was in store owing to my motor neuron disease. KSSN advised me that TeX could be a great friend to help fight my terminal solitude and he initiated me by installing TeX unto my system, gave me his copies of Knuth: TeXBook and Lamport: LaTeX — A Document Preparation System. Thus started my sojourn with TeX which resulted in fighting effectively my disease for the last three decades, setting up a successful business of text processing using TeX and organizing the TeXies around the country to form the Indian TeX Users Group (TUGIndia) in Trivandrum. Although, the first two have implications to me alone, the last one had long lasting impact on the text processing industry, particularly, in the technical publishing world where dependence on TeX is enormous. India became one of the leaders in processing technical content using TeX to create a multitude of electronic deliverables from the sources seamlessly. KSSN served as the Chairperson of TUGIndia since its inception till TUG2002, the 24th annual conference of TeX Users Group, conducted in Trivandrum in 2002. KSSN is not a great orator nor he a great communicator, but he excelled in small groups and discussions with his clarity of thinking and astute logical perfection. His shyness often deprived him of several things in life which he intensely deserved. His pursuit of research was seldom noisy, he only enjoyed collaborating silently with a handful scholars like John Meakin, Francis Pastijn, et al., the obvious effect was not a plethora of publications, but fewer ones with denser content which outweighed quantity. His research led to the development of the concept and terminology of Biordered Set in the theory of semigroup. He had the same kind of approach — intense, deeper, committed and fearless — to all aspects of life which is not without its own course of testing times. Although, KSSN has a highly modernized and scientific outlook, his family establishment consisted some of the most orthodox people around. So, when his eldest son chose to marry a Brazilian girl and when his only daughter chose to marry a Christian, he had to face the wrath and non-cooperation of his family establishment. Nevertheless, he didn’t subjugate himself to any of the pressures, but boldly sided with his children who paid scant attention to the orthodox inundations of other elderly members. The early Vedic education had its own beneficial impact in the latter part of KSSN’s life. Surely, the elements of tolerance and philosophical disposition should have percolated into young KSSN’s mind even without his knowledge. But for these great qualities, KSSN would have undergone long bouts of mental agony when he confronted his eldest son’s tragic death at the end of a long phase of acute depression. Although KSSN was in the latter half of his life, he could boldly and with highest degree of calmness, accept the loss of his son, not without pains, but nonchalantly as only sages can do and accomplish the distressful task of reassuring his other children and grief stricken wife and bring them back to normal life. It was indeed a trying period in the life of any gentle soul of his kind. His brilliant career as a professor of mathematics was also sprinkled with a lot of controversies, particularly, with the majority of faculty members in the academic council and board of studies voting against his motion to revise mathematics syllabus of various courses in the University of Kerala. He had to resort to the extreme step of walking out of the council meetings in protest against the intransigent attitude of teachers to change an outdated syllabus, course content and scheme of examinations. In fact, he introduced a different kind of entrance test for students seeking admission to research programs in mathematics wherein he provided a few math problems to each student, intending to do research, with freedom to discuss the problems with anyone or consult any text book before filing answers within a pre-defined period. Albeit, it was a novel way of evaluating one’s aptitude and intelligence, KSSN’s procedure markedly deviated from the stone age method of seeking answers for a set of stock questions that were usually memorized by the students to write on the answer paper without any application of mind. Many faculty members and researchers as well didn’t like the radical shift from the customary practices and tried their best to tarnish the image of KSSN although they didn’t succeed in their efforts. Beautiful fonts enchanted KSSN always. He has an unfulfilled dream of creating a complete set of fonts for Malayalam, his mother tongue (mine as well) using Metafont, the programming language developed by Donald Knuth to define vector fonts. In tune with Knuth’s warning in the Metafont Book — type design can be hazardous to your other interests. Once you get hooked, you will develop intense feelings about letter forms … — KSSN hasn’t got into this task yet since a lot of work remains to be done in his huge research volume under publication now. An excellent TeX programmer himself, in the pre LaTeX2e days, KSSN had written several packages in plain TeX, like the one to format documents in two column that can balance columns in the last page, although with the advent of LaTeX2e, his packages became obsolete since he himself switched from plain TeX to LaTeX. KSSN truly believes and lives to the saying that your achievements will be incredible if you pay scant attention to who takes away the credit. For this singular reason, he leads a very peaceful and fulfilling life to the amazement of people surrounding him. Thank you for sharing so much detail about KSSN, who is an inspiration to us all. Thanks for posting such a wonderful page about Prof KSSN. For a person like me, who had recently joined the community, it is more like reading a book on him. All I know all these days were only his name and him — in person. It is most influencing while reading that I read at least a single paragraph once in a day since I came to know about this page. I sincerely suggest that this page should be made available to the entire team of RVT. I require a huge box with a limitless dimension to complete this equation! His presence with us itself is a gift! Oh no, visual TeX…I’m afraid. I downloaded and installed it. With the basic options it’s not too large: 29.8MB approximately. Actually typing directly into the document and seeing it appear is a bit odd after using LaTeX for so long. I found the editor a bit confusing. It acts sort of like a word processor except that there is evidence that logical markup can be done. I don’t like this program too much because for example, a beginner might be tempted to center some text and make it larger, instead of using the actual title commands. It might allow poorly made documents simply because it looks so much like a word processor. Also the LaTeX code which it generates is a bit messy (maybe I’m being a bit stringent here, but if someone else wants to do it by hand afterwards it might be frustrating). I was all in tears even though most of the facts were known to me. I am completely with Prof KSSN. “I do not know but I will do my best to find out” is the mark of a teacher who deserves respect, not condemnation. Respect has to be earned, it is not an automatic right through age or qualifications; politeness yes, respect no. Perhaps those who hounded KSSN did so out of fear that the thinness of their own knowledge in some areas would be revealed? To feed a student an incorrect answer to cover one’s lack of certainty does no one any favours, least of all the student. You might remember me. I met you in 2002 as the designer of Rachana font. Now only I come across your page and I’m feeling a sense of loss. All these years KSSN, the mathematician, the TeX wizard, the man who wished to design Malayalam metafonts… was unknown to me. I should meet the great man. Would you give me his address, email id and mobile no.? Right now I’m engaged in typesetting ‘Logbook of an observer’ by Jinesh (http://www.nalamidam.com/archives/15658). Logbook is in Unicode Rachana and typest using XeTeX. It is compiled by my young friends in SMC (Swathanthra Malayalam Computing). First draft of the book has successfully come out and in two months time it will be published by Akam Books, Kannur. I’m a begginner in TeX and miles to go. I think LaTeX can do wonderful things in book publishing industries in Kerala. Since PageMaker and InDesign reign the DTP arena, the shifting even a ten percent seems to be imposssible. Still I’m determined to do a campaign. Perhaps I can convince ‘little’ publishers like Akam who has printed all their twenty five books in traditional scripts (though in ASCII using PageMaker). You will be a great help in this task. And KSSN is an inspiration. Prof KSSN’s colleagues were mistaken and unwise but their attitude is quite common amongst teachers at many levels in the UK. Observation over 40 years suggests that the better the teacher’s grasp of their subjecy, the more likely their are to admit gaps. Surely teh correct response when one does not know is KSSN’s: “I do not know but I will do my very best to find out.” I have found that even young children have a very sensitive nose for what our US friends call bull’s droppings! Any teacher will, at some time, teach students who are already quicker at the subject than the teacher. Pretending is a good way to lose respect.